The territory of Northern Rhodesia was administered by the [British] South Africa Company from 1891 until it was taken over by the UK in 1923. During the 1920s and 1930s, advances in mining spurred development and immigration. The name was changed to Zambia upon independence in 1964. In the 1980s and 1990s, declining copper prices and a prolonged drought hurt the economy. Elections in 1991 brought an end to one-party rule, but the subsequent vote in 1996 saw blatant harassment of opposition parties. The election in 2001 was marked by administrative problems with three parties filing a legal petition challenging the election of ruling party candidate Levy Mwanawasa. The new president launched an anticorruption task force in 2002, but the government has yet to make a prosecution. The Zambian leader was reelected in 2006 in an election that was deemed free and fair. Despite progress in privatization and budgetary reform, Zambia's economic growth in 2005-06 remained somewhat below the 6-7% per year needed to reduce poverty significantly. Privatization of government-owned copper mines relieved the government from covering mammoth losses generated by the industry and greatly improved the chances for copper mining to return to profitability and spur economic growth. Copper output has increased steadily since 2004, due to higher copper prices and the opening of new mines. 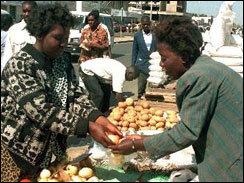 The maize harvest was good again in 2005, helping to boost GDP and agricultural exports. 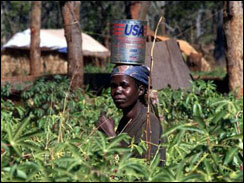 Cooperation continues with international bodies on programs to reduce poverty, including a new lending arrangement with the IMF in the second quarter of 2004. A tighter monetary policy will help cut inflation, but Zambia still has a serious problem with high public debt.